Provider and patient reminders can be effective in increasing rates of preventive screenings and vaccinations. However, the effect of patient-directed electronic reminders is understudied. To determine whether providing reminders directly to patients via an electronic Personal Health Record (PHR) improved adherence to care recommendations. We conducted a cluster randomized trial without blinding from 2005 to 2007 at 11 primary care practices in the Partners HealthCare system. A total of 21,533 patients with access to a PHR were invited to the study, and 3,979 (18.5%) consented to enroll. Patients in the intervention arm received health maintenance (HM) reminders via a secure PHR “eJournal,” which allowed them to review and update HM and family history information. 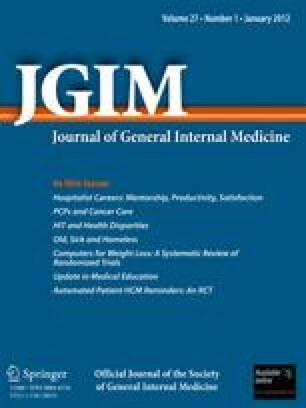 Patients in the active control arm received access to an eJournal that allowed them to input and review information related to medications, allergies and diabetes management. The primary outcome measure was adherence to guideline-based care recommendations. Intention-to-treat analysis showed that patients in the intervention arm were significantly more likely to receive mammography (48.6% vs 29.5%, p = 0.006) and influenza vaccinations (22.0% vs 14.0%, p = 0.018). No significant improvement was observed in rates of other screenings. Although Pap smear completion rates were higher in the intervention arm (41.0% vs 10.4%, p < 0.001), this finding was no longer significant after excluding women’s health clinics. Additional on-treatment analysis showed significant increases in mammography (p = 0.019) and influenza vaccination (p = 0.015) for intervention arm patients who opened an eJournal compared to control arm patients, but no differences for any measure among patients who did not open an eJournal. Providing patients with HM reminders via a PHR may be effective in improving some elements of preventive care. The online version of this article (doi: 10.1007/s11606-011-1859-6) contains supplementary material, which is available to authorized users. This work was partially supported by AHRQ Grant R01-HS013660-02: Shared Online Health Records for Patient Safety and Quality. AHRQ was not involved in the design, execution or analysis of the study, or in the preparation of this manuscript. The study protocol was approved by the Partners HealthCare Human Research Committee and registered at ClinicalTrials.gov (NCT00251875).